Trouser: Classic fit. Single pleat. Slant side pockets. Machine washable. Never been disappointed with the quality or service. Good communications, good product, good price, swift delivery, no quibble exchange also carried out promptly..... cannot fault them! Good quality clothing and great customer service. Highly recommended. Excellent service! Prompt delivery of a blazer I needed urgently for Henley met my requirements in every respect. I'm so glad I found Brook Taverner online when looking for outsize and I will be sure to use them again. Tell Brook Taverner to stop it ! Tell Brook Taverner to stop it ! They know I love them, there I have said it. Quality, efficient Order system, smart secure packaging, shop from the Sale Catalogue ONLY and you have the near perfect Company. I just want to slap them ! I have always wanted my own Morning Dress and lo and behold the elements appeared in the recent Sale catalogue. The coat is beautiful and well made, the trousers are to die for and the soft dove grey waistcoat, very elegant but understated. I will probably never get to wear it at a function but plan to be sartorially dressed when they screw the lid down. Now where did I put my '100 Things To Do Before You Snuff It ' list ? Gone on, give them a try you can always send it back. The sneaky buggers have add a Loyalty System that repays with real pounds, so having treated yourself, a few weeks later up pops a message that you have earnt ( my best so far ) £75.00 ! . . . Utter Bliss. 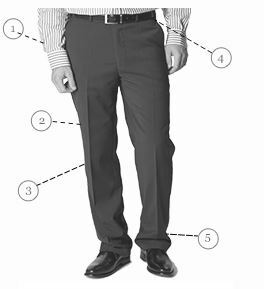 A good quality pair of trousers which look very smart when worn with a belt. Unfortunately they lack side adjusters which one usually finds on such trousers and which help if you don't wear a belt. With this addition they would have merited 5 stars from me. Top quality products. First-class service consistently. Courteous staff ever so polite. Excellent service and products which makes online shoping at Brook Taverner such a pleasure! Keep it up! I have purchased many items from Brook Taverner in the past and can say in all honesty that i have never been dissatisfied with any of them. Always good quality ,and good fit,and i will continue to use them for future purchases. Really good quality trousers, great cut and fit. Fast postage. Hassle free internet shopping. Thank you for your A1 service. This trouser is immaculately beautiful, well cut and fit for all seasons. I am very glad that I have it in my wardrobe . I have purchased many items from Brook Taverner in the past and can say in all honesty that i have never been dissatisfied with any of them. Always good quality ,and good fit,and i will continue to use them for future purchases.